What is PLANET Gives Back? Each year the Professional Landcare Network, (PLANET) organizes a volunteer service event during their annual Green Industry Conference. The fourth annual PLANET Gives Back is scheduled for Wednesday, October 22, 2014 in the city of Louisville, KY. PLANET Gives Back and partneres seek to promote a positive impact for the host city of our annual GIC. Pictured (right) are the 75+ attendees who volunteered during the 2013 event. 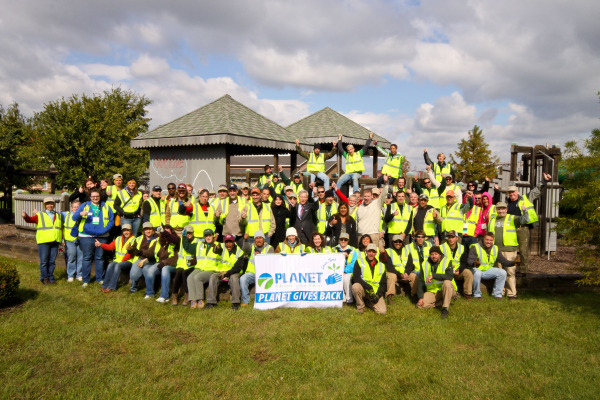 Participate in a live #Landscapechat during PLANET Gives Back on Wednesday, October 22, 2014 at 2pm ET, held at GIC and GIE-EXPO in Louisville. This live chat will feature PLANET, and other green industry leaders tweeting live from the event. New This Year - The majority of the work will take place at Meyzeek Middle School, which was identified through YouthBuild Louisville, an education, job training and leadership program organization designed to help young adults realize their potential. Approximately 75 volunteers will landscape, aerate, and fertilize the school grounds, preform maintenance on perimeter fences, and beautify the front entrances with the use of raised planter beds. The Event - Approximately 75 volunteers will landscape, aerate, and fertilize the school grounds, perform maintenance on perimeter fences, and beautify the front entrances with the use of raised planter beds. In addition, volunteers will be installing trees at a nearby location, St. Vincent DePaul. This week’s #Landscapechat - Some of the happenings taking place at GIC and the GIE+EXPO will also be highlighted.